Wilson, a leading name in performance and racing induction systems, has expanded its repertoire and announced an amazing new intake system for all 5.9 liter common-rail Cummins engines from 2003-2007. 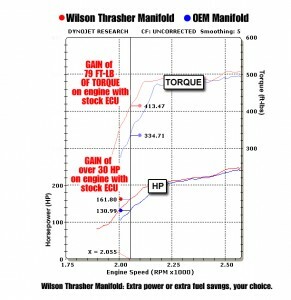 Depending upon the state of tune, the Thrasher can generate in excess of 300 extra ft-lb of torque, or with lighter throttle use, the equivalent in fuel savings. In contrast with the OEM arrangement, this new induction system provides greater equality of air-fuel distribution, especially in the cruise zone of 2,000 to 2,250 rpm. 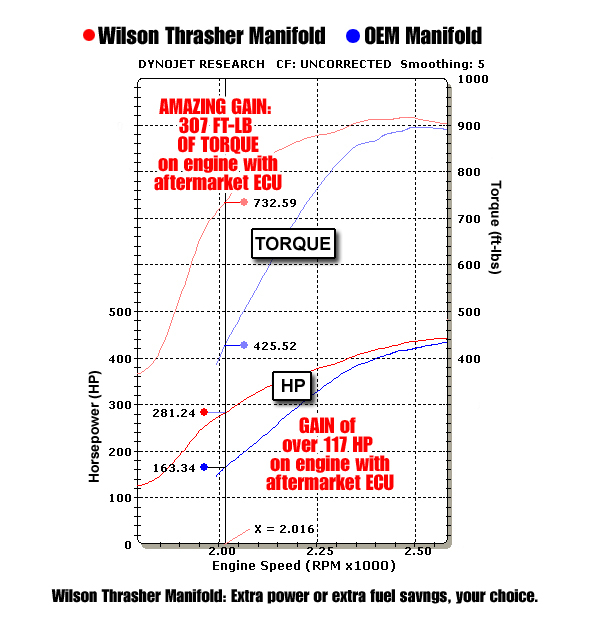 As a result, the Thrasher generates not only amazing gains in both torque and fuel economy but also improves horsepower output, lowers exhaust gas temperatures, reduces exhaust emissions, and improves drivability. Check out the results from the strict disciplines of the dynamometer graphs above. 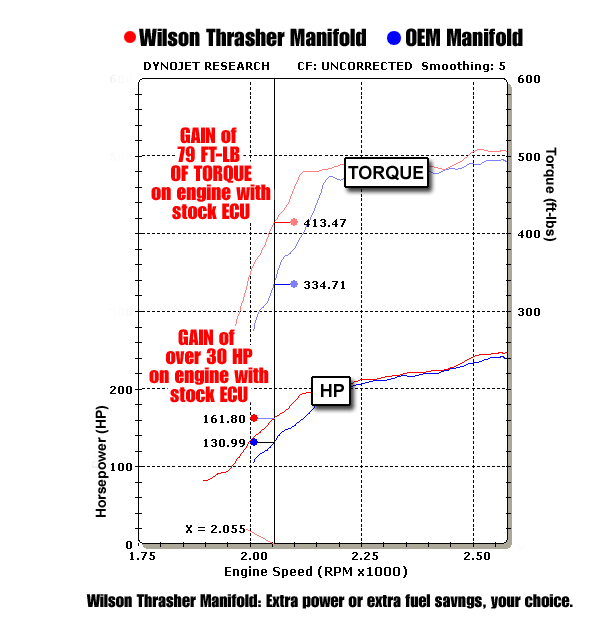 One graph demonstrates the gains in both torque and horsepower of the Wilson Thrasher manifold when compared with the OEM manifold, both of which are tested with a standard ECU. In the other, both are tested with an aftermarket ECU. 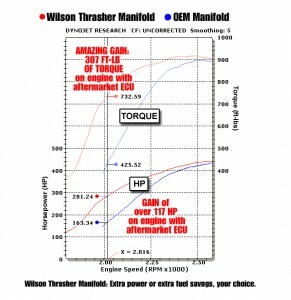 What is more, the greater the power improvements made to this engine, the greater the performance or economy benefits of the Thrasher. In simple terms, the Thrasher requires less accelerator pedal action to pull, tow, or cruise; therefore, it uses less fuel. 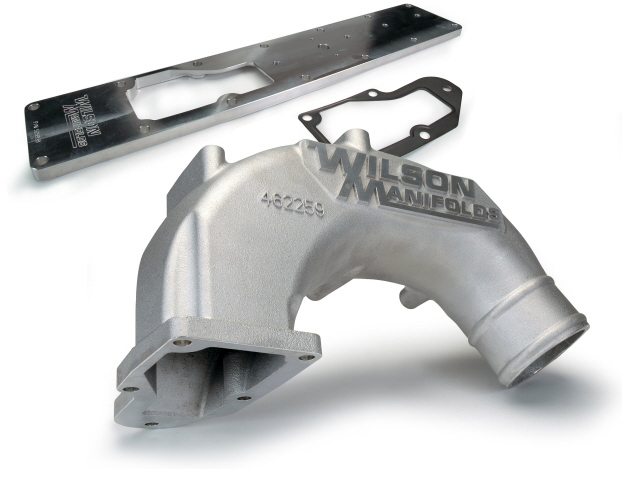 The Wilson Thrasher kit contains a cast alloy elbow, billet baseplate, stainless/Viton rubber gasket, and all necessary fasteners. Installation takes about two hours.